This year's Sweet Adelines Champs, Rumors - Dale, Judy, Peggy and Charla - steadfastly refuse to take themselves seriously. 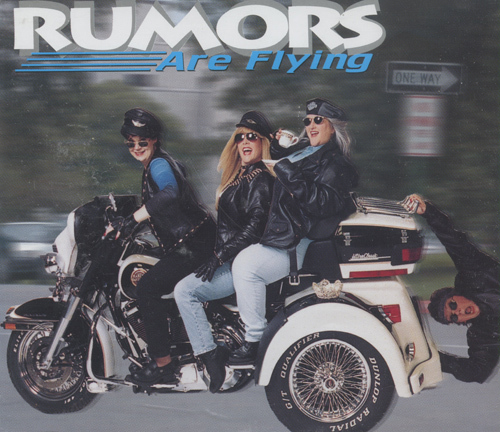 From this refreshing and modern approach, as exemplified by the cover photo of the four on a motorcycle, (even if just barely), we hear women's barbershop for the year 2000. The first cut, "We Are Family," which is as catchy a dance single as was ever written, is definitely not a contest arrangement, but it's good fun ("Don't You Worry About A Thing" has a similar vibe). The remainder of the material consists of deft and confident versions of songs such as "I Didn't Want To Fall," "My Buddy" and "Jeepers Creepers." "The Lady Down The Hall" features a poignant solo lead by Charla Clare. Rumor's sound is exceptionally full, thanks in large part to the resonant and poweful bass of Peggy Barnes, which can be heard to good effect in "Come Take Your Place In My Heart."